The summer Concert Season is gearing up & I'm pretty excited! Relaxed summer evenings - at venues around town, or listening to live music outdoors. Or just enjoying a cocktail with friends. I love the look of a tailored blazer over a vintage (or vintage-style t), with nice jeans and fun heels! And how amazing is this one?! White, black, tailored, chic - Need I say more?! Actually I'll take this whole outfit!!! 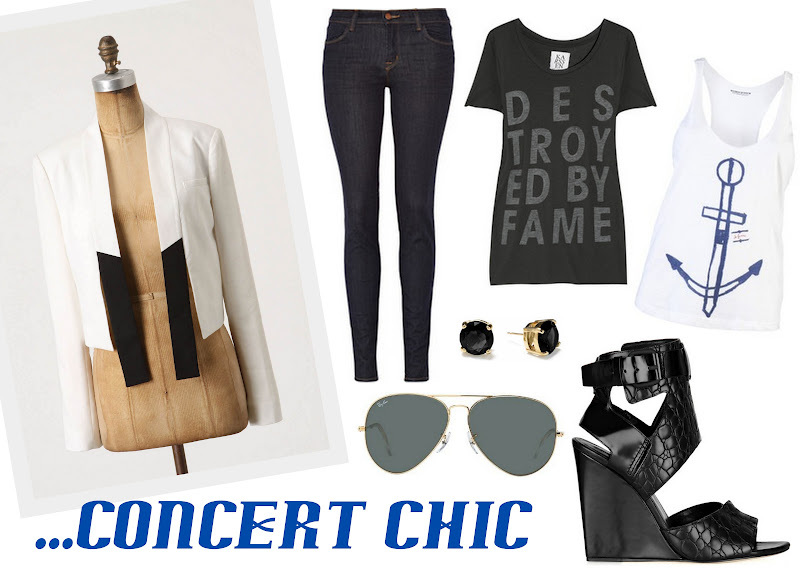 I just need one of these T's, Blazer & shades (yes, the shoes are now mine!)! Do you have any concerts planned for summer? anchor tank, get in my closet! I am so pumped about concert season! Chic outfit! SO excited for summer concerts! And stop it with those wedges, those are crazzzzy good. I am going to have to plan a concert now! I love this look! this is soooo my kind of look:) love it! going to lolla - how about you?? I'll take the whole outfit as well! Those wedges... ah! Love this whole look!! Gorgeous round-up! i LOVE concert season! omg those shoes are amazing!! I love that jacket! Super cute.